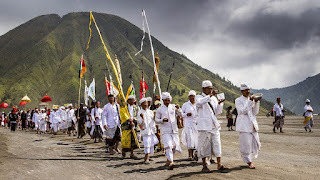 The most interesting ritual during Mt Bromo tour namely The Yadnya Kasada ritual, wherein this ritual always celebrated every year on the 14th day of the Kasada month on the Hindu lunar calendar between July - August month. Despite the cold weather about 07 - 10-degree Celsius. 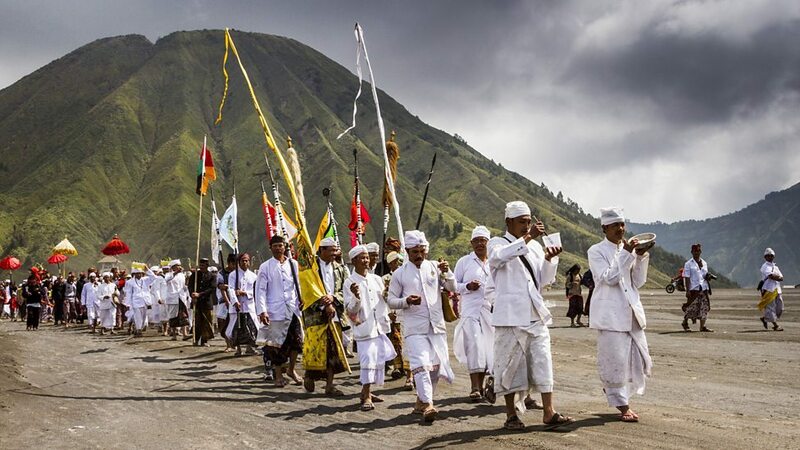 In this time, thousands of Bromo tenggeres people come together to the Pura Luhur Poten Temple celebrated the main Ritual Ceremony named The Yadnya Kasada ritual. The ritual going on all night. The Yadnya Kasada Mt Bromo 2018 celebrated from July 9 to 10. Beside Mount Bromo tour package, the existance of Kasada Bromo ritual make the tourists spend a longer time here. Usually, tourists would only stay to enjoy their trip for one to two days, but they can stay three to four days this time. We saw almost 10,000 people within the three days. We're still waiting for the official data from TNBTS,” said the tourism ministry's archipelago marketing development deputy, Esthy Reko Astuti. Pendopo Agung Ngadisari Village (Balai Agung Ngadisari village) became the main location as the place of Kasada Yadnya procession. Kasada ritual begins at 7 pm and also as the offerings begin to be distributed to the Luhur Poten temple on the sand right at the base of Mt Bromo. After the Kasada ritual ceremony was held, the Tengger tribesmen, community leaders and also the Tengger people gathered to pray together pleading for salvation, prosperity and while expressed gratitude for the natural results already felt. At dawn, the offerings are brought to the crater, while reciting the mantra, they throw their offerings into the mouth of Crater. To witness Yadnya Kasada, Most tourists enjoy this volcano from four main entrance gates which are located in Pasuruan, Malang, Lumajang and Probolinggo regencies. Most foreigners enjoy the Sunrise trip, from Surabaya International Airport or Malang using Car or Motorbike. If You want the organized your trip, transportation and, Facility, You can visit Our Contact.